Hazard finished Manchester City off with a very fast counter and a cool finish. 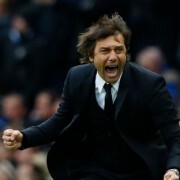 Conte is getting his team on track and have turned the team from last year again into a group of winners. A defeat was certain for Manchester City when Sergio Aguero flew into a knee-high challenge and Fernandinho grabbed a player by the throat in an melee, shoving him over an advertising hoarding. City’s players didn’t just lose a match to a big title rival. They lost their heads. 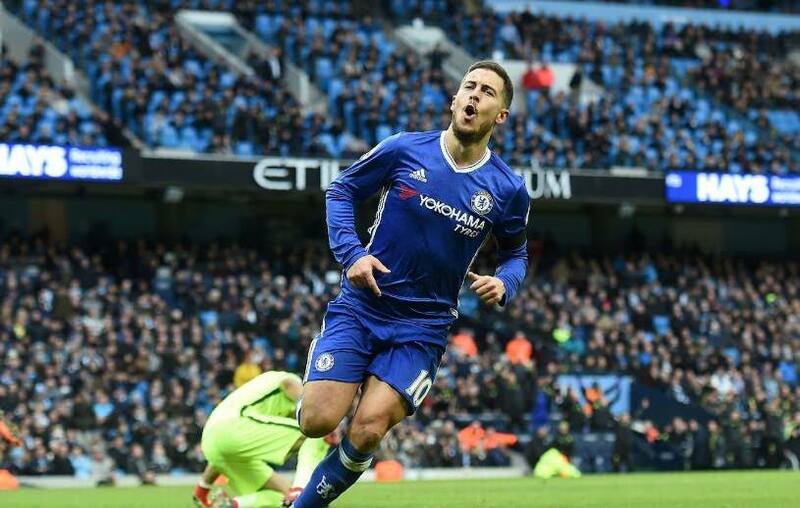 Hazard wheels away after finishing off Manchester City by scoring 3-1 on counterattack. In a action-packed game between two of the Premier League’s heavyweights, Chelsea scored three goals in the final half-hour and rallied for a 3-1 win at City on Saturday. It was an eighth straight victory for the leaders, all of them coming since their coach, Antonio Conte, switched to a 3-4-3 formation that is making the team irresistible going forward. City dropped four points behind Chelsea in fourth place. Aguero and Fernandinho, two mainstays of Pep Guardiola’s City team, were both red-carded in those final seconds that saw tempers flare and both sets of players pushing and shoving on the field. 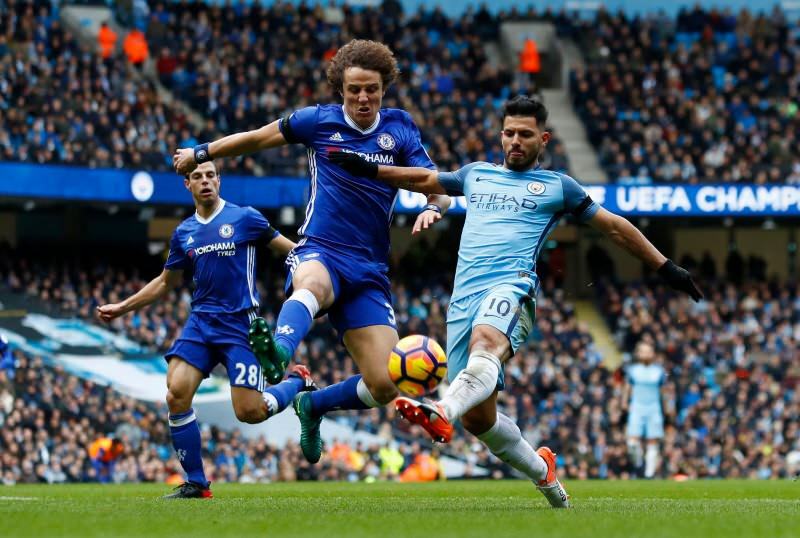 Aguero is set to miss the next four matches for his lunge on David Luiz, because it was his second sending-off this season. 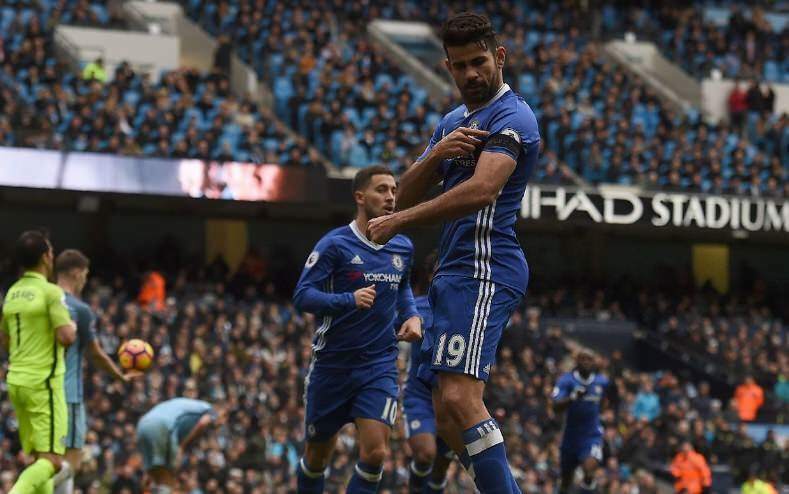 Diego Costa celebrating his goal. Diego Costa sparked the turnaround for Chelsea, canceling out a 45th-minute own goal by teammate Gary Cahill with an equalizer in the 60th after chesting down Cesc Fabregas’ long ball. Costa set up substitute Willian to put Chelsea ahead in the 70th and Eden Hazard added a third in the 90th, before Aguero’s tackle on Luiz sparked the late skirmishes. Eden Hazard already confirmed he would only leave Chelsea through the big gate: with a title?